Developed in the 1930s, lymphatic drainage is a delicate form of massage that stimulates the body's lymphatic system, improving metabolism, helping the body to eliminate waste and toxins and providing a boost to the immune system. Lymphatic drainage massage utilises very light pressure combined with soft pumping movements in the direction of the lymph nodes and is usually carried out through clothes. 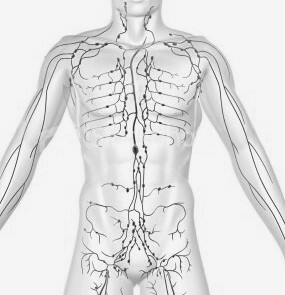 By stimulating the lymphatic system using these techniques, it works more efficiently and in turn boosts the immune system, clears blockages, eliminates toxins, transports nutrients to cells and increases the metabolism. Boosting the immune system, as well as helping the body ward off illness, a Lymphatic Drainage treatment can facilitate general feelings of health and vitality. It has a positive physical effect, improving the appearance of the skin and reducing puffiness caused by water retention, sprains and rheumatism, and it promotes the body's own healing mechanisms.